Kolkata - On Saturday 25 April 2015, Christian parents of Don Bosco School, Park Circus had an interactive session (9.15- 11.15 a.m.) with the school authorities. This is a very good annual exercise meant to improve communication and the bonding between the two stakeholders of Value Education. The event assumed greater significance in the Bicentenary Year of the birth of Don Bosco, a friend of the youth. Fr. Bikash Mondal, Vice Principal, began by welcoming all parents and dignitaries viz. Fr. Vincent Lobo, Fr. Gregory Monteiro, Fr. Babu Das, the Parish Priests of Christ the King, Our Lady of Vailankanni Church and Fatima Shrine respectively. Fr M.C. Jose of Auxilium Parish, Sam Mathews (Senior School Coordinator) and Mrs Fernando (Junior School Coordinator) were also present. After the lighting of lamps, Fr Bikash set the tone with a Power Point presentation on The meaning of Christianity and Effective Parenting. 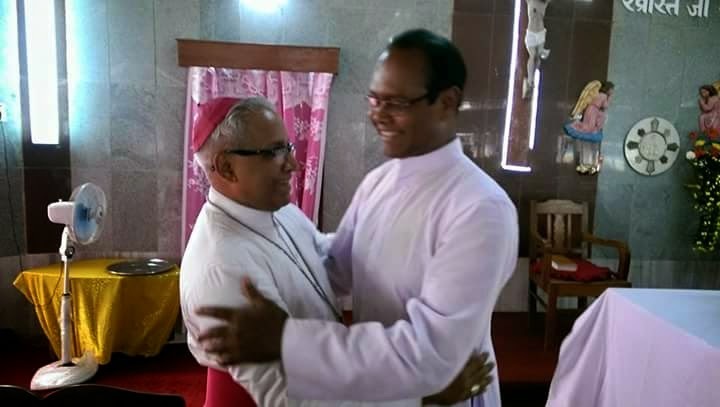 Fr.Joseph Pathickal – Rector and Principal, highlighted Don Bosco’s life, exhorted parents to instill self-esteem in their children and to make “Do as I do” the slogan to imbibe good habits. He said Prayer was the best form of communication and requested parents to conduct short family prayers regularly. Fr Vincent Lobo emphasised on Faith Formation for,without it all the worldly gains would be meaningless. He urged well-to-do families to sponsor the education of at least one poor child in one’s parish. Fr Babu remarked many parents neglected their children’s Christian upbringing though they spared no pains in sending their children to different coaching classes. He urged parents to teach love, humility and forgiveness. Fr Monteiro said Christian means Christ is in us. We must always thank God and inculcate faith in our children especially during the first five years. He asked parents to appreciate their children’s good work without winking at their weaknesses. The programme ended with a short question-answer session. Krishnagar, Nadia - The Krishnagar Media Fest 2015, the first of its kind in the vernacular in Bengal, was successfully organised by the Regional Commission for Social Commission, Bengal-Sikkim Region in active collaboration with SIGNIS Bengal. The two-and-a-half days residential programme was held at Sanjeevani, Krishnagar, from 13th to 15th April, 2015. A total of 55 participants, including priests, religious sisters and students from the diocese of Asansol, Baruipur and Krishnagar attended this fun-filled learning experience. The Festival was inaugurated by the Chairman of RCSC, Bishop Joseph Suren Gomes, Bishop of Krishnnagar, who invigorated the participants to take an active role in the world of Communication and Media. Fr. Robin Gomes, Regional President, SIGNIS Bengal, in his welcome speech, stressed on the need for integrating Communication and New Media in our personal and pastoral life, especially in the backdrop of present environments. Fr. Prolay Boidya, Secretary to the Commission, also addressed the participants and encouraged them to take full advantage of the opportunity. - Applications of Media : Internet, Editing, etc. The resource persons and animators for the various sessions included Fr. Robin Gomes, Fr. Devraj Fernandez, Mr. Farrell Shah, Mr. Alexis Badal Gomes and Mr. Lawrence K. Gomes. The highlight of the Fest was a Prak-Nabobarsho Adda on the evening of 14th April – a cultural programme to ring in the Bengali New Year, with performances by the participants themselves. The Media Fest concluded with an evaluation session, where the participants were divided into six groups to draw up an action plan for activating Communication cells and activities in their respective parishes and dioceses. All participants were awarded Certificates for their valuable contribution to the success of the Media Fest. Kolkata - The Holy Father, Pope Francis has appointed Fr. 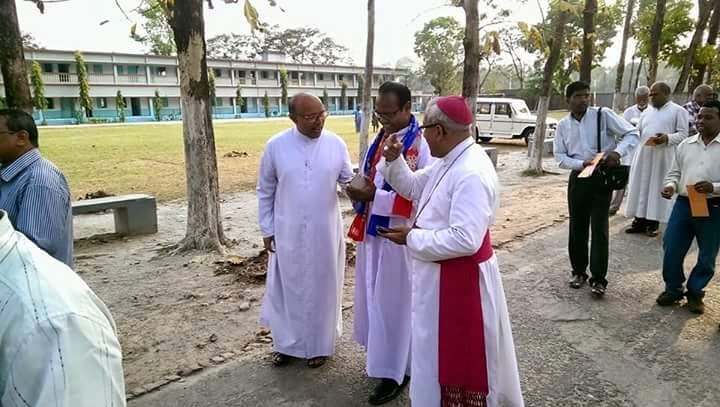 Vincent Aind as new Bishop for the Diocese of Bagdogra. This was made public in Rome on Tuesday, 7 April, 2015, at about 15:30 hours, Indian Standard Time. He has B.A. Eco. Hons from St. Joseph’s College, Darjeeling, M.A. in English from North Bengal University, B.Th. from St. Joseph’s Seminary Mangalore and Doctorate from Gregorian University, Rome. He was ordained a priest for the Diocese of Jalpaiguri in April 1984. He speaks and writes English, Hindi, Nepali, Bengali, Sadri, Mundari, Italian and also reads French. As a ordained priest he has served the diocese of Jalpaiguri in different capacities. He was the Asst. Parish priest of Christ the King parish, Damanpur, and was also the Parish priest of St. Lucy’s church of the same diocese. After obtaining a doctorate in Rome he was at the Morning Star Regional Seminary as Professor of Philosophy, Spiritual Director and Rector. The Diocese of Bagdogra (1997), suffragan of the Archdiocese of Calcutta, has an area of ​​1,200 square kilometers and a population of 1,015,000 inhabitants, of which 54,301 are Catholics. There are 19 parishes, served by 58 priests (28 diocesan and 30 religious), 34 religious brothers, 151 nuns and 15 seminarians. The Diocese of Bagdogra was vacant since March 12, 2011, following the transfer of Archbishop Thomas D'Souza of Calcutta. With text from Vatican Radio/CBCI. Photos courtesy Isaac Harold Gomes.